and can cut your summer cooling costs by up to 45%. What are the main benefits of Enviro Solar Screens? • The Solar Screen Fabric we use is Phifer ... only the best will do! 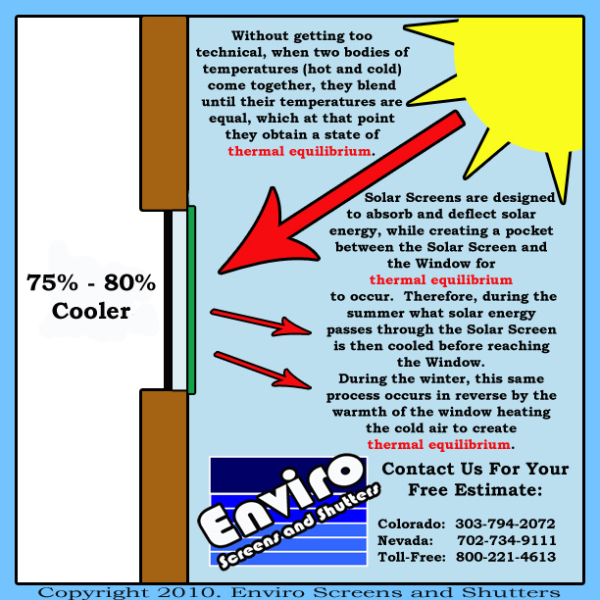 Enviro Solar Screens block the sun's heat and prevents drapes, carpet and furniture from fading and sun rot. 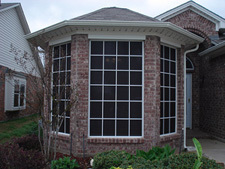 Our Solar Screens work with your windows open or closed. They won't crack, peel, bubble, or obscure your view. They provide excellent outward visibility and daytime privacy and security. Our screens stop insects, but not the breeze. 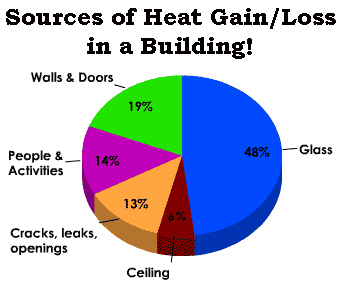 U. S. Department of Energy who states that "in hot climates, the primary strategy is to control heat gain by keeping solar energy from entering the interior space while allowing for good visibile light transmittance for viewing and daylighting. Solar Screens that intercept solar radiation ... that prevent infrared and ultraviolet transmission while allowing good visibility, and are useful retrofits for hot climates." In colder climates, the focus shifts to reducing heat loss. The U.S. Department of Energy states that "vinyl" is a "low conductivity" material. Therefore, it is not conducive to the cold. In other words, it will not get cold and therefore will not allow cold to pass by way of it. Hence, your window doesn't get 75-90% of the cold/hot air from the outside, nor will it allow the heat/cool from inside the home to pass through it to the outside. Your window stays undisturbed by the temperature outside. Solar Screens create a barrier to the weather. Enviro Solar Screens block the sun's heat and glare, relecting, absorbing, and dissipating the heat before it strikes the window. This chart shows a window with Suntex installed. In midsummer as much as 230 BTU's can fall on each unprotected square foot of glass. 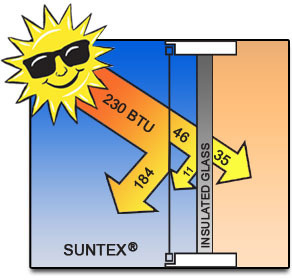 With SunTex installed, up to 90% of the sun's infred and ultraviolet transmissions are reflected, absorbed, and dissipated before it reaches the window. SunTex Solar Screen is made of strong vinyl-coated polyester fabric, and is pet resistent. SunTex is mildew and fade resistant. In order to maintain SunTex's pristine aethetic look, only mild cleaning with soap and water is recommended. 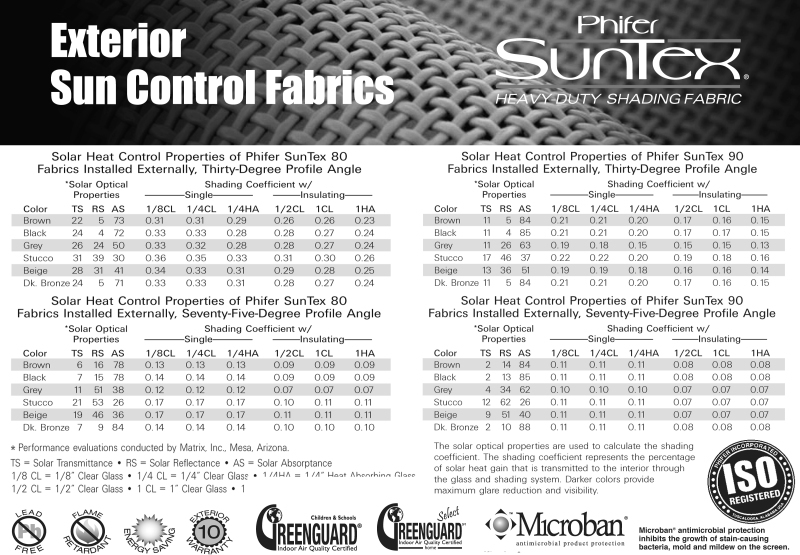 We only use Phifer SunTex products. whether it is summer or winter. That's why their products work. Using the same aerospace principles that NASA uses to separate the hot and cold temperatures, Phifer developed their product for the public to control their energy consumption. All of our Solar Screen SunTex materials are of the best quality and are warrantied for ten (10) years against changes in its physical properties. This very durable material, will not tear, fade, or deteriorate from the weather. 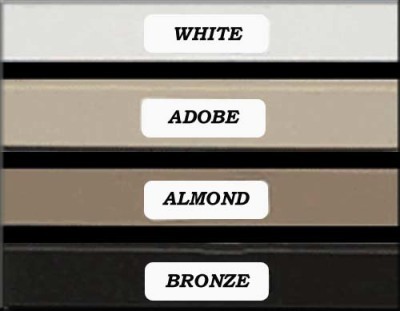 Darker colored screens shade more effectively, are the most functional and the most popular. Tests have proven that darker colors are the most effective at blocking the sun. This is due to less light being reflected through the screen toward the glass. Darker colored screens also allow a clearer view through the screen. 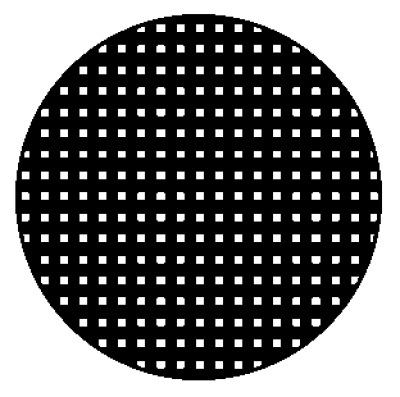 This is simply because your eyes look THROUGH darker colors, while your eyes look AT lighter colored screens. This is why sunglasses have darker lenses. The chart to the right represents the colors our customers purchase most. Grids allow you to maintain the same style of Grids found on your windows, or give your windows the pattern they were lacking. Whatever the case may be, this type of Custom Solar Screen Grids can add life to your windows ! We can reproduce any existing Grid pattern, or create new patterns ! To enhance the aesthetic look of your solar screens on your home or business, we provide four (4) different colors of screen frames to ensure a perfect look on every house or business. All of our Solar Screens with SunTex come in either 80% or 90% weave!